I have been watching more carefully since posting this yesterday, and there are a few hits that have not been critical. in a crowd it looks like it's on all enemies, but i've purposely been targeting less to watch it. While every hit is not critical, it is at least a normal hit.There haven't been any body shots against fatties using assault charges, even more than +5 RSL. OK I did some testing, a level 14 common assault with bronze 10% piercing can normal hit a level 24 normal walker occasionally. I'll see if I can get enough critical chance badge on him & use non-piercing weapon to see if I can get any non-bodyshot hit. I wanted to test, but the only no-spawn map in the distance was still "low-level". Guess I can't test just yet. I just use 1 call on survivor, some will come with piercing weapon. All charged attacks are AT LEAST guaranteed non-body shots, regardless of enemy level and type. All Hunter/Shooter/Scout charged attacks are guaranteed critical attacks. If you make a second attack on the same turn as a critical (e.g., Shooter second attack or Scout Swift Strike), it is a regular attack. All charged attacks do at least as much damage as a normal attack, if not more due to Charging, Ruthless, and critical hits. There was a bug where charged attacks only did about 3/4 the damage of a normal attack because damage calculations were performed using the base, non-upgraded damage numbers of a weapon, but that bug has been fixed. All Hunter/Shooter/Scout charged attacks are guaranteed critical attacks. Hunter/Scout charged attacks are guaranteed critical attacks as well as the FIRST charged attack made by Shooters. I don't think the second Shooter charged attack is even always a non-body shot. @tabernac Shooter using their charged attack is non-bodyshot guaranteed critical hit, then the second shot is just a normal shot they usually do. Just like warrior double attack except their charged attack didn't guaranteed critical hit. @Monsuta I agree totally, but I wanted to tease the definition out a bit to avoid confusion! Thanks! How is that clarification? It isn't, I read through your post too quickly. Apologies! After some testing this weekend I couldn't replicate a normal attack against a high level walker. Daryl(lvl 14) shoot many times against lvl 21 walkers and beyond and all of them where body shoots(more than 100 times). So I'd think we can also agree that you cannot crit when a body shoot happens. In other words body shoots will limit your crit chance therefore high crit chances are kind of useless at high RSls for some classes. What I saw though is that if you do enough damage to kill the walker you don't get the "body shoot" in game text, and I'm guessing that was what confused me on first place. So I'd think we can also agree that you cannot crit when a body shoot happens. I didn't know you where wondering about this. This has been verified by NG long ago. Body-shot is a beat all kind of thing. Yeah, this is really annoying when you want to find out body-shot chances against low-level. Yes, if you only play RSL+3 and beyond. It still is great for outpost, those critical hits will blast away your opponents. It still is great for every mission below RSL+3 (+ 1 per pink, +1 if piercing on weapon). Assaults is a class that can tank and control a crowd, so I'd think we don't have much room for that crit hit chances. Yeah, you might be on to something here, I'd much rather use the spot for something else. But still, throw in Sasha. Get charged and unleash the critical damage. Could work. uhu, sasha can help you out though. To summarize. Body-shots ruin critical chance for the end-game. Hands down. This was no secret, even verified by NG themselves. Yes, If you don't play outpost and don't play any mission below RSL +3 (+1 for piercing, +1 per pink star). I guess so, I'll probably use that room for something else. Still though, throw in Sasha, and you'll be critical hitting great mobs of walkers all the time. That's what I call crowd control. On warriors you may have crit chance, but in high RSL may be tricky to get 3 charge points to release a powerful crit attack. If you Don't play outpost and don't play Missions below RSL 3+, then critical chance is useless. Furthermore, critical chance is ruined for high level play. @jimmorrison369 I agree. Although you probably won't need high critical chances to deal with enemies that are below RSL+3, so crit hit chance is very situational to maybe 1 warrior or 1 assault aoe that relays on crit and fast charge chances. In general damage seems better, and in many classes combined with +crit damage and/or mitigation health/dmg resistance. Outpost is a different game I mean, you may need a different set of survivors I was just talking about the PVE part of the game. So yes I was ignoring that part of the game. I can't do it right now, but I'm planning to test some body shot iteration and piercing. I have some low weapons with golden piercing that I could use, on low level survivors in scavenger missions. I'd think that's the best way to test it. You have to good survivors to keep the low one alive and he can shoot many times. If rounds get out of control, you flee and take hospital time just on that low survivor. I've even completed a few runs like that this weekend, so I'm just wasting "some time"
Yup, usefulness of critical chance is a very small window yes. 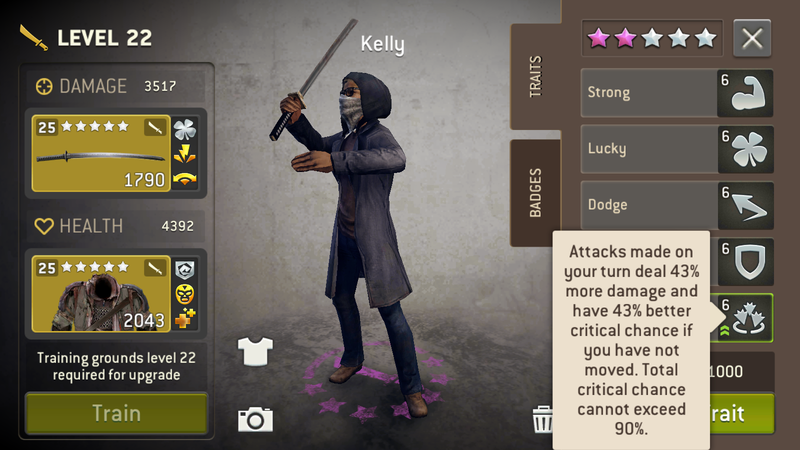 @mik81 @jimmorrison369 Power Strike is very useful in scout & warrior, it can increase their normal attack damage significantly. Level 6 power strike increase 43% damage while not moving, even without critical attack. @monsuta I know, you are right, my problem in general with melees is that in order to use that trait you need to be hit by a walker (not really but many times) at high RSL that is insta struggle or insta dead. Sure shot, and in general ranged vs melees is way better and easier to use, and most of the times more successful too. You could us it if interrupt wasn't affected by body shoots. You could also use it dodge wasn't affected by guaranteed crit chances from high lvl walkers... so someone really needs to get a hit in order for you to use it, you could have some shield bruiser there to get the hit, then your melee killers finish him.... but you can't kill 20 walkers like that... Idk I want to use melee but ranged survivors seems to be so much better... I would change that trait to remove the part: "have not moved" to "if you only move 1/2 of your movement". Then we could talk about more balance between classes. @mik81 That's where a meat shield bruiser come in handy, you can also move your scout & warrior to spawn block then attack the new spawn walker too. By using all melee team, you can no need to worry next spawn walker too if your scout kill enough walker to reduce spawn down to zero. It's very useful in some map. And they're good against armored too cause no body shot if their level is within non-bodyshot range. @Monsuta That's a really good tip. Thanks!!! Not sure if it had anything to do with critical chance, but my level 22 Rufus just critical hit a level 19 armored without using any piercing weapon. To be fair, this isn't new (for me at least). Armored don't have 100% body-shot on lower level.